I saw this movie on YouTube today. Praise YouTube! This has got to be one of the most amazing movies ever, one I never would have gotten the opportunity to see otherwise. 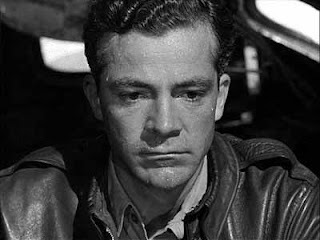 It is also helped by the fact that I have fallen madly in love with Dana Andrews. Oh, if only Miss Vintage were back up so that I could divorce that tiresome Paul Newman and work on stealing Dana away from Millie. It shall be so difficult otherwise. As I suppose I have made obvious, I think the best part of TBYOOL was Dana Andrews, by far. He creates a sympathetic character out of somebody who does things that society frowns upon. He's the type of person that makes me think I would do exactly the same thing if I were him. Teresa Wright, too, but she was a little too stuffy in my opinion. She looked way less uptight in Shadow of a Doubt. For some reason, today I cannot make myself write a proper review. I have hardly anything to say about this movie except that it's wonderful and Dana Andrews is devastating. Maybe it's because I had an English literature exam today, which really kills one's desire to write, but my mind is absolutely blank when it comes to intellectual things to say...about anything. I did, however, like the title. It implies that the best years of the veterans lives are not actually behind them, that their readjustment only paves the way for better things ahead. At least, I took it that way because of that line out of a Brad Paisley song that goes, "These are nowhere near the best years of your life." My interpretation is definitely colored. And something else I just can't believe is that the average rating of TBYOOL by girls under eighteen on IMDB was 3 out of ten. It's absolutely mind-boggling that there are so many morons out there, so many blind morons that didn't take one look at Dana Andrews and think, "Ten! Ten! Ten!" I can understand not liking it, but a three??? What the heck?? OH MY GOSH YOU ARE NOT TAKING DANA AWAY FROM ME. EVER. EVER. EVER. HE IS MINE. That said, I'm glad you liked the movie. Dana is so utterly brilliant in it. March did NOT deserve the Oscar, Dana did (of course HE wasn't even nominated)! Now, you need to watch lots and lots of Dana films!!! It's absolutely mind-boggling that there are so many morons out there, so many blind morons that didn't take one look at Dana Andrews and think, "Ten! Ten! Ten!" Anyway, GREAT post! And hilarious! And well-written (seriously!!!)! I'd love to see posts like this from you if it means you will post more often...REALLY! Kate and I were discussing how much we need more of your (and I quote) "brilliant hilarity" in our lives, so really, MORE posting please! Anyway, this is a long comment...wow! Wow, thanks Millie, this was an absolutely lovely comment! Well, most of it. The first--what--five sentences were a little less sweet than the rest of it, which I know you didn't intend, but I can ignore them. It's okay, you can take Dana, for the meantime. I'm willing to wait around until you get dumped, no, I mean accidentally drowned in the ocean because James and I got back together when we went out to see East of Eden last week and we shall be getting married as soon as my divorce is final. I'm not sure if I should invite you to the wedding though, considering your general opinion of my husbands. But thank you again for everything! Everything besides that anyway. And I shall try to post more often...more about that later. LOL Merriam, this was hilarious!!! I looooooooooooooove this movie too! And Dana definitely deserved a 10. Moronic is right. What did you think of Fredric March? Millie doesn't like him, but I happen to adore him. Great review anyway. It really is a marvelous film. A few comments on this one. I've seen it several times, and it always 'gets' to me. Not a dry eye in . . . my skull. Yes. It's immediately-post-WWII 'propaganda', showing the difficulty of adjustment G.I.s had -- in 'lite' fashion. Although, when you think about it, it took a lot of 'Hollywood guts' to feature the non-actor Harold Russell playing the fellow with prosthetic arms. And plenty of pluck on Russell's part. Dana Andrews had already made a mark in Laura (1944), playing a tough cop. That 'noir' feeling carries through all these BW films of the 40s. In a way, this was the last gasp of Depression/wartime 'community', insofar as one had been forged under FDR. In 1946, the year of this film, Congressional elections went whacko, HUAC started investigations, the GOP began its 'come-back'. It was short-circuited only by the slender win of Truman and the 'liberal' GOP nomination of Ike, the Daley graveside votes for Kennedy in 1960, and (post-assassination) landslide of LBJ in 1964. Once Southerners recognized the 'party of Lincoln' was the lesser of two evils -- the liberal Dems seeming the 'party of MLK,Jr', they left in droves. Dem politics have been on the defensive for 45 years, and we've been faced with the likes of Reagan, Gingrich, and those rightwing clones of Cheney and company, vastly rich from corporate wealth. I've gone on far too long for an 'entertainment entry'. But what was a film put forward as communitarian balm now looks very quaint and so very inapplicable to a time when the USA no longer has a true claim as 'democratic savior'. The scene where Frederick March is standing in his home and Myrna Loy sees him arrived. The banker who earned his sergeant's stripes fighting for democracy. Unbeatable. James will NEVER take you back. Not after the way you treated him, right before he dumped you. Sheesh. Don't you remember! There isn't going to be any wedding, sadly. James hates you. @Harley: Thank you! I wasn't very fond of Fredric March. He wasn't bad, but Oscar-worthy? Nah. @TrulyFool: Very interesting comment. You provided a nice political perspective. 1) No, I don't remember. I haven't the faintest idea what you're talking about. Of course there'll be a wedding. 2) Well, let's say Paul is the first husband we're talking about, besides the clown punching bag. 3) Do you realize you began and ended your comment in two all-caps, exclamatory sentences of nine letters? Fascinating. Objectively speaking however, (if one can be objective about movies, which is probably impossible), I think this is all-around the best movie ever made. Most critics will pick "Citizen Kane" of course, and taking nothing away from that movie, I disagree. It's "Best Years" for so many technical reasons, plus it has an emotional impact that "Kane" does not. Great post! This is one of my fave filsm of all time. I never get tired watching it and always find something new with every viewing. Its flawless in my opinion and your so right about Andrews..his character is my favorite. The journey he takes is heartbreaking and he looks so handsome doing it! LOL. I also love the rest of the cast. Myrna Loy is rock solid as the wife. I have an affection for this film because it was part of my thesis for my film studies class way back when. I don't know. Dana Andrews is great, but I think they may have known what they were doing giving the Oscar to Fredric March.